We have British outlets and plugs here in Malawi, leftovers from the days when Malawi/Nyasaland was a British Protectorate country. They&apos;re big and chunky, but generally work well. 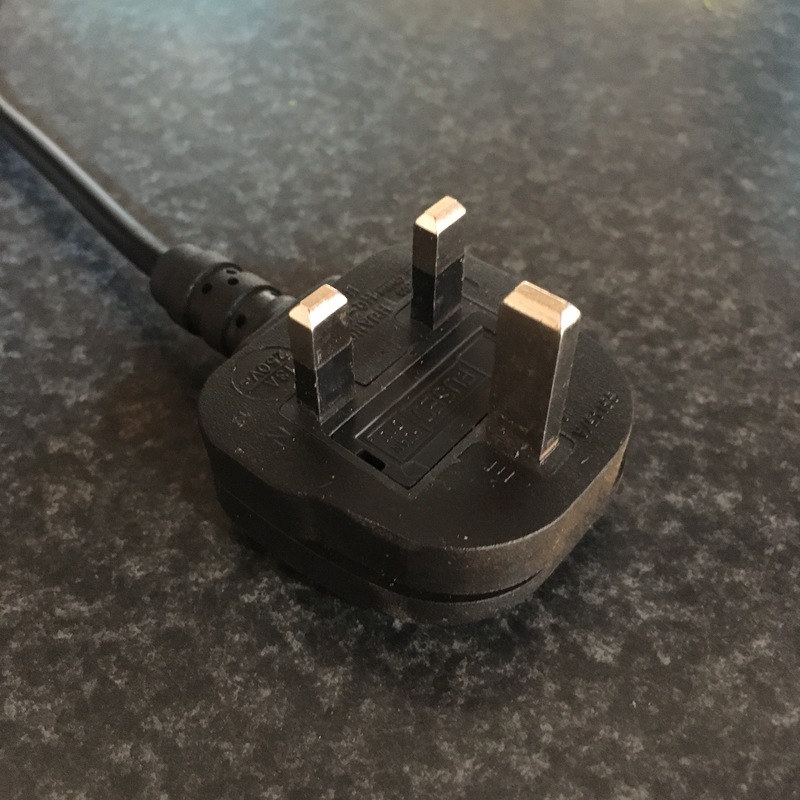 The tricky part is that we live closer to South Africa than England, so most electronics come to Malawi with South African plugs: two round prongs instead of three rectangles. They fit, but it takes a little work. 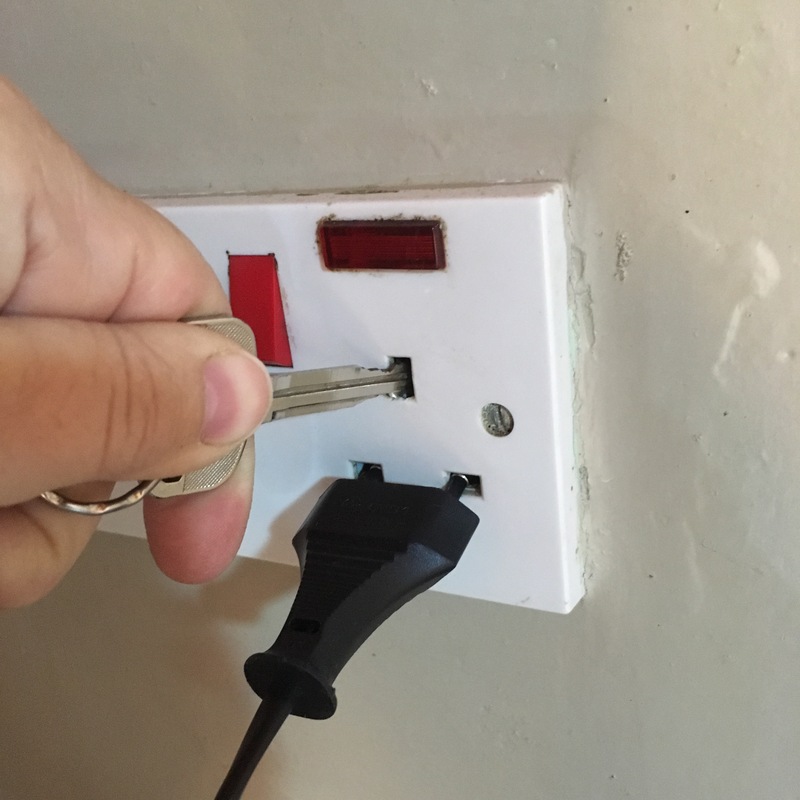 You have to use a small object, say a key, to depress the safety button in the top hole so that the bottom two holes will open for the South African plug to go in the outlet. Don&apos;t let your children see this picture! Yes, I&apos;m putting my keys in the outlet! But it&apos;s ok. The outlets here are switched, as in the red button next to my finger can switch the outlet off and on. And the hole my key is in is the ground, so there&apos;s no power going to that hole anyway, even if the outlet is switched on. Honestly, it took me a couple years before I was willing to do this with keys – I would always run and find a chopstick… just in case! So with all the issues with South African plugs in British outlets, we really like it when we can get a good appliance that has a British plug. For instance, a toaster. We have had an American toaster oven for years. I love it. But, we do have to run it on a transformer here, and it only toasts 2 pieces of bread at a time. That&apos;s ok until you have more than 2 people in your toast-loving family. Enter the British toaster. Isn&apos;t she a beauty? Well, she is to me! When I was getting ready to go to England in May to hike Hadrian&apos;s Wall, Matt and I realized that this was our chance to get appliances with British plugs – from England! 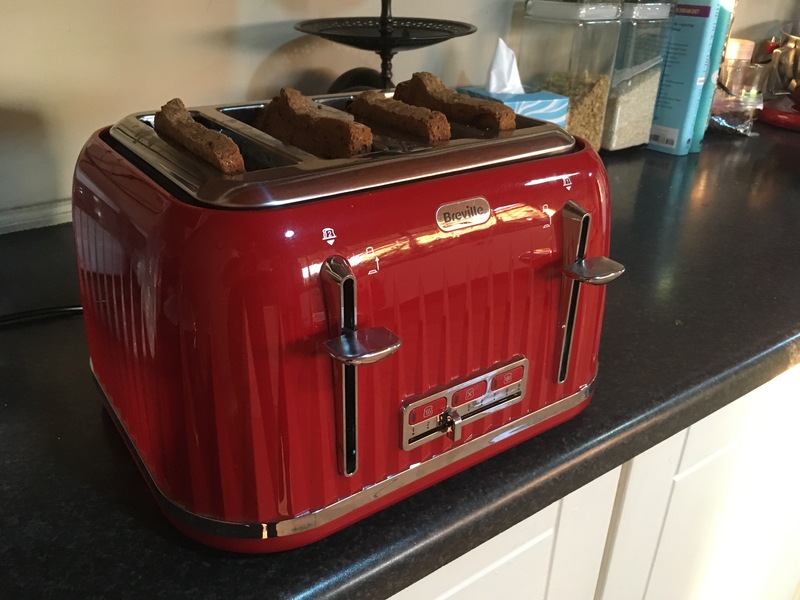 So Matt bought this beautiful red toaster, and a new hair dryer, on Amazon UK and sent them to a "parcel pick-up" (American: locker) location. 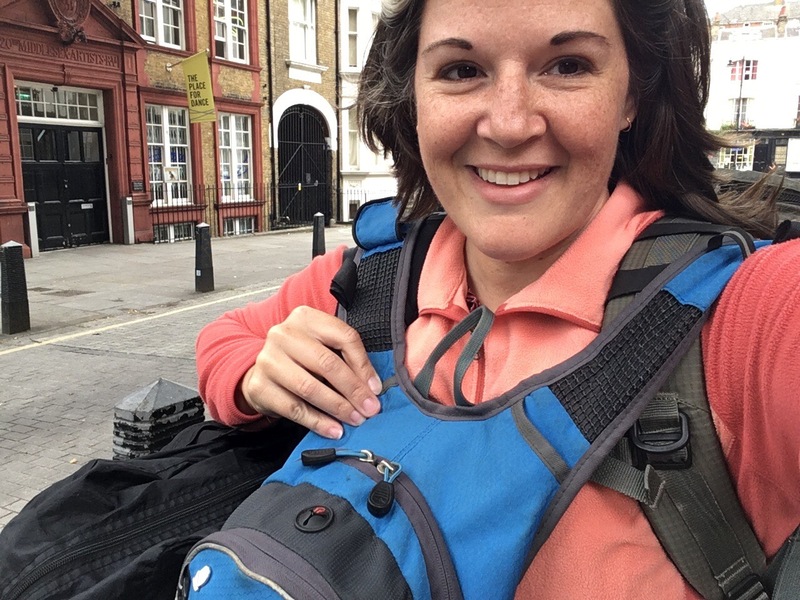 After the hike, I found the parcel pick-up location near Kings Cross Station, tossed my new toaster and hairdryer in a duffel bag, and took the Underground to Heathrow to fly home. This pic was proof to my family that I had the toaster and was on my way home. And the extra effort has been worth it. Did I mention that we are a toast-loving family?! Remember summer days of drinking straight out of the garden hose? Well, we don&apos;t do that here in Malawi! We have a great water filter for our drinking water and for years we only filtered. However, about 9 months ago the city stopped treating the water for a period of time and we started researching the boil and filter option. Ugh. Boil water every day? Not me, not in my house. I don&apos;t want to pay more for gas to boil 20 liters of water every day, and I REALLY don&apos;t want to heat up my house every day with 2 huge pots of boiling water! This is Africa, in the tropics, we&apos;re already hot enough! I&apos;ll just clean those filters again, and we should be fine! But then I learned the difference between how to get bacteria out of your water and how to get viruses out of your water. Our Katadyn Gravidyn filters remove something like 99.95% of all chemicals and bacteria from the water. But viruses are so small they just go straight through the filters. Boiling kills viruses. Done. End of discussion. I became a firm believer in boiling AND filtering water that day! I&apos;m not even going to get into the details of the sewer pipe that leaked into the water main of the neighborhood just north of us… Boil and Filter is my new mantra! 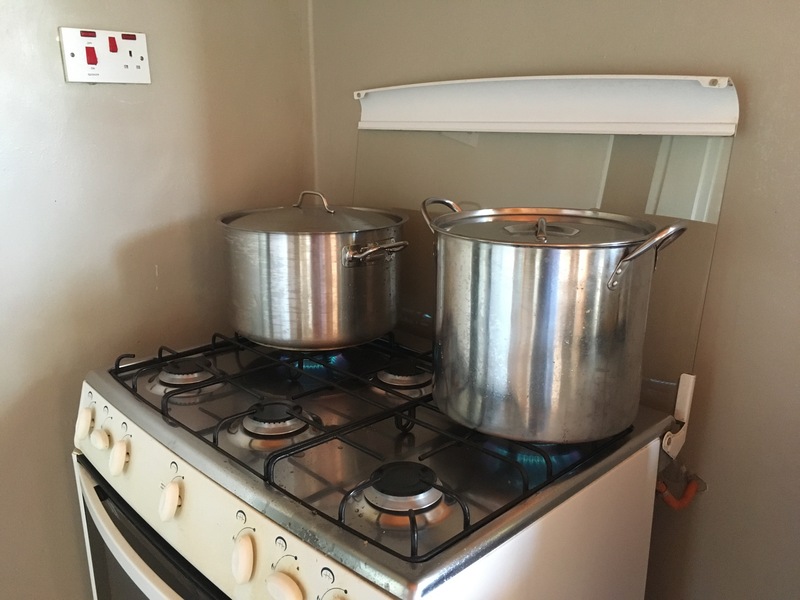 So we fill up our two 10L pots with tap water almost every evening and bring them to a boil (which takes about exactly 67 minutes). We crack the lids and let them cool overnight, and in the morning we pour the cooled, virus-free water into the top part of our two filters. 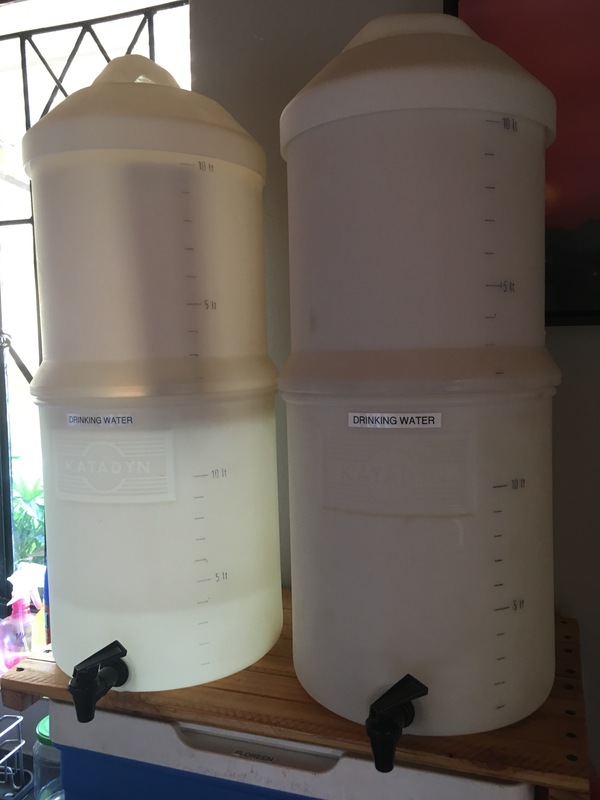 Over the next couple hours, the water works its way through the filters and stores in the bottom of the unit for easy access. Is it a process? Yes. Do we have fewer tummy bugs now? Actually, yes. Do I carry the water on my head. 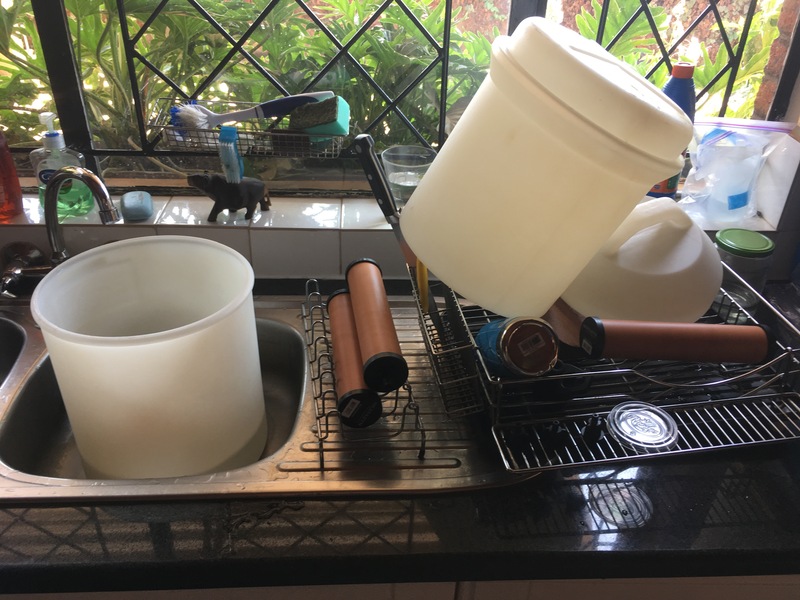 Um, yes… a 10L pot of water is too heavy to carry in front of me without spilling, so I lift it up on top of my head to carry it across the kitchen. Sorry, no selfies of that – I&apos;m not that coordinated! And that&apos;s how we get drinking water here in Lilongwe! We drink it, cook with it, and wash fruits and veggies in it. I&apos;m thankful for the modern technology of such great filters, and for the ancient technology of fire that now rounds out our water treatment process. I do think that all that work makes the water taste just a little bit sweeter! 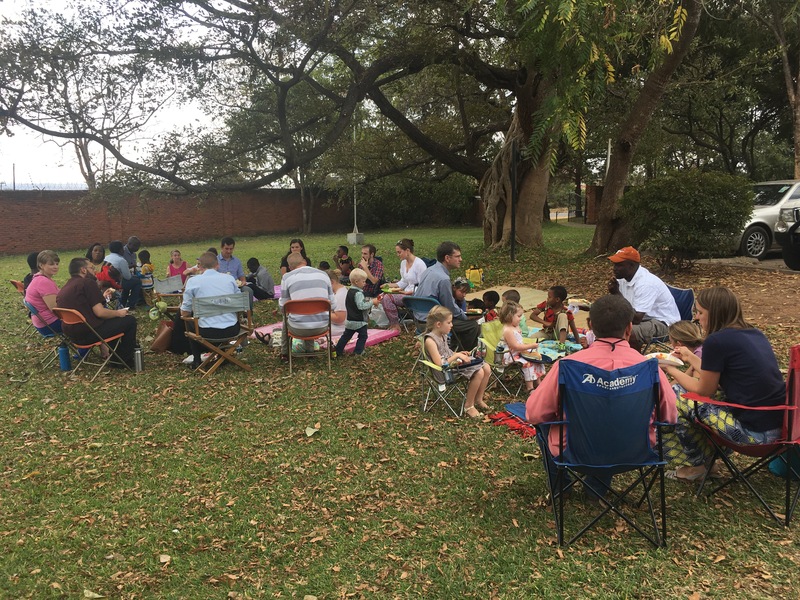 We had a church picnic yesterday! 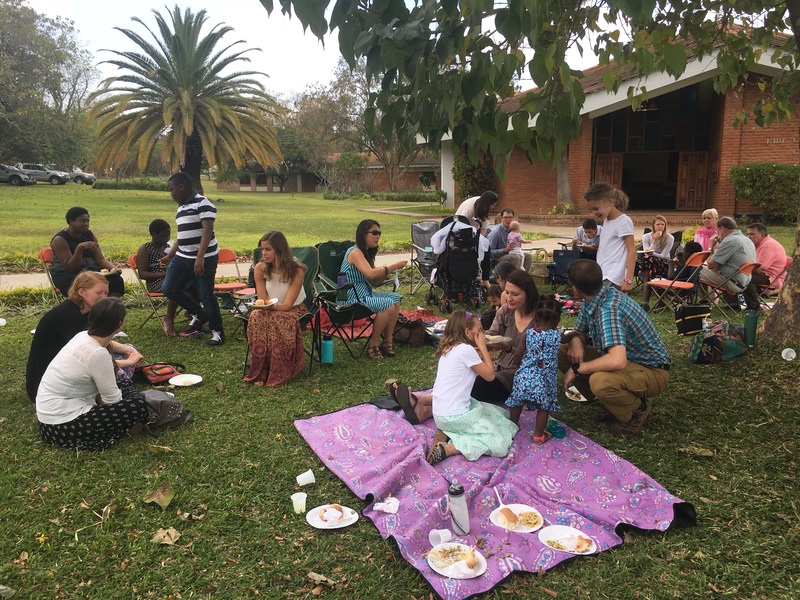 This was the second time during the school break that we got to spend a Sunday afternoon with our church family, picnicking on the lawn. It takes a lot of hot dogs to feed this crew, so we&apos;ve learned a few tricks. 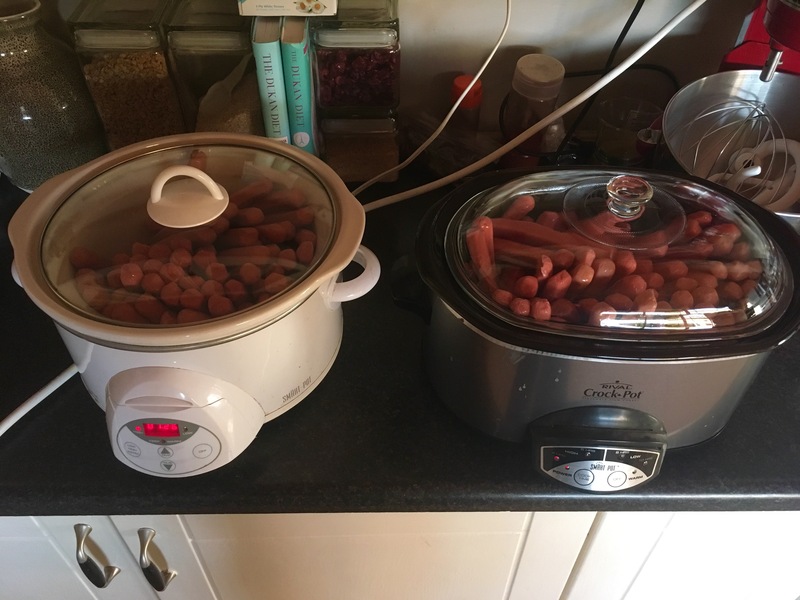 Did you know you can cook 60-70 hot dogs in a crockpot? The ones on the edges even get a nice sear! I brought some bunting for a festive look, but needed a little help to tie it up. You never know when your husband&apos;s tree climbing skills will come in handy! It&apos;s always good to spend time with church family, but this day was especially sweet. 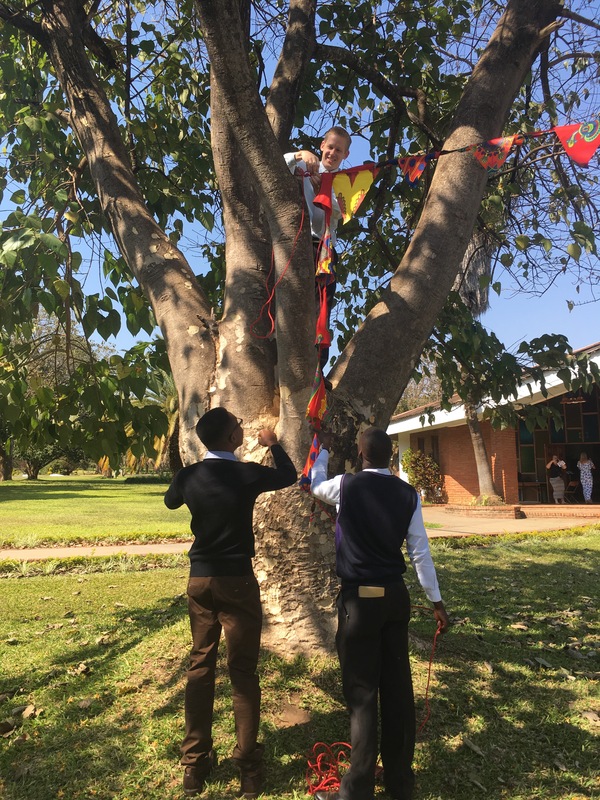 Just before the picnic, one of our elders, Gideon Manda, had preached on the unity of the body of Christ from Ephesians 4:4-6. For such a diverse church, this was an important reminder, and made our fellowship time a reminder of our unity! As I looked around at the people on the lawn at lunch, I thought about how some of them are more comfortable eating their lunch with forks and spoons, some with chopsticks, and some with their bare hands. It&apos;s the times when we focus on those differences that we miss the beauty and eternality of the unity Scripture says we have as the body of Christ. One body, one Spirit, one hope, one Lord, one faith, one baptism, one God and Father of all. This picnic was just a foretaste of heaven, when people of every tongue, tribe, and nation will join together to worship the Lord! 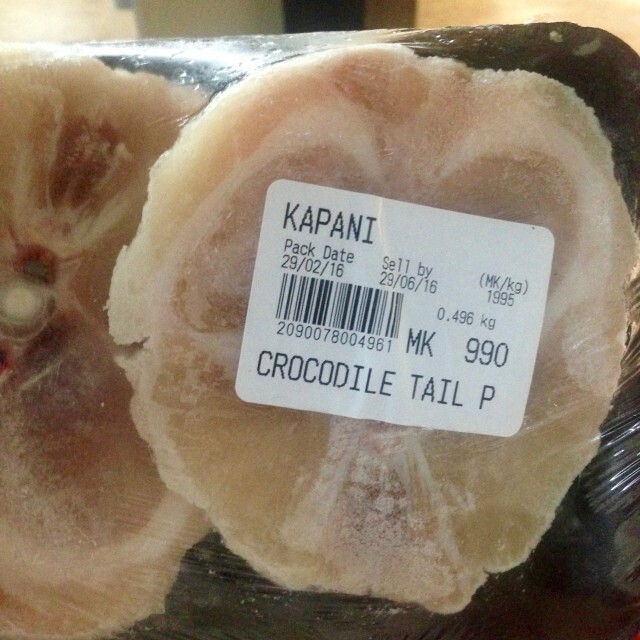 At $1.23/pound, crocodile tail is the cheapest meat in town. We usually eat more beef, chicken, fish, and pork, but every once in a while we have crocodile. Like when my 6 year old asks for it. And in case you have the idea that we go hunt crocodile, skin it, and eat it, I&apos;m sorry to disappoint you. We buy it at the grocery store! There aren&apos;t a lot of recipe blogs that tell you how to cook crocodile. 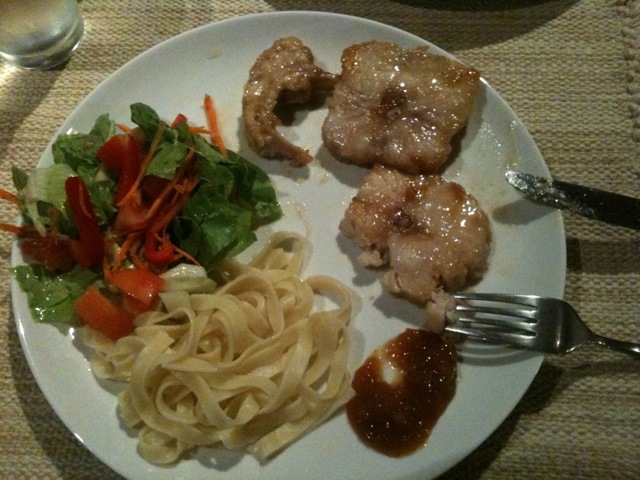 A few years ago I found a few adventurous cooks who gave some great pointers and came away with this: crocodile is like pork. Cook it quick and fruity. So until today I&apos;ve done just that. Barely defrost, cover in fruit chutney, and fry in a skillet or grill it. Today, I decided to do a quick sear and finish it in the oven. Power is off (no defrosting), and we don&apos;t have much chutney. So, a little experimenting. This shot give you a good idea of the cross-section of the bone in crocodile tail, as well as the rings of fat that run through the meat sections. 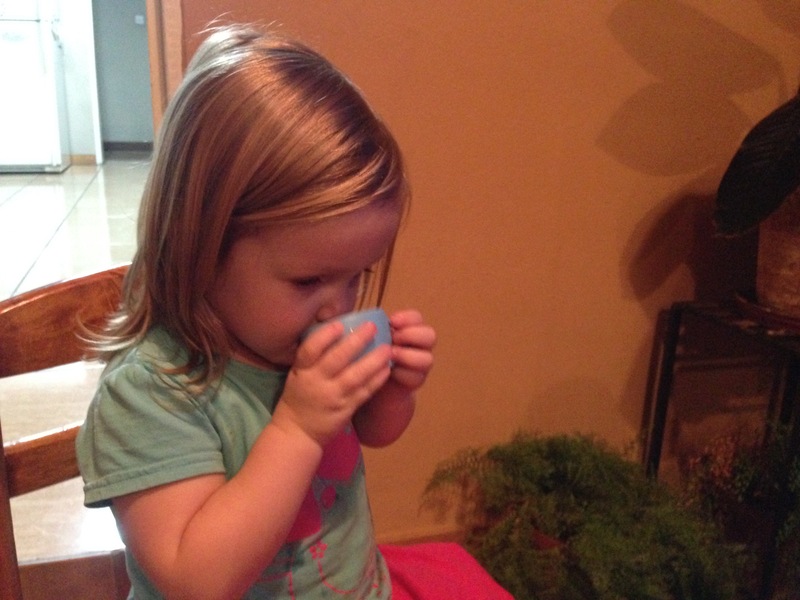 It passes the 3-year-old test! We decided it is good with mustard, and really great with homemade barbecue sauce! 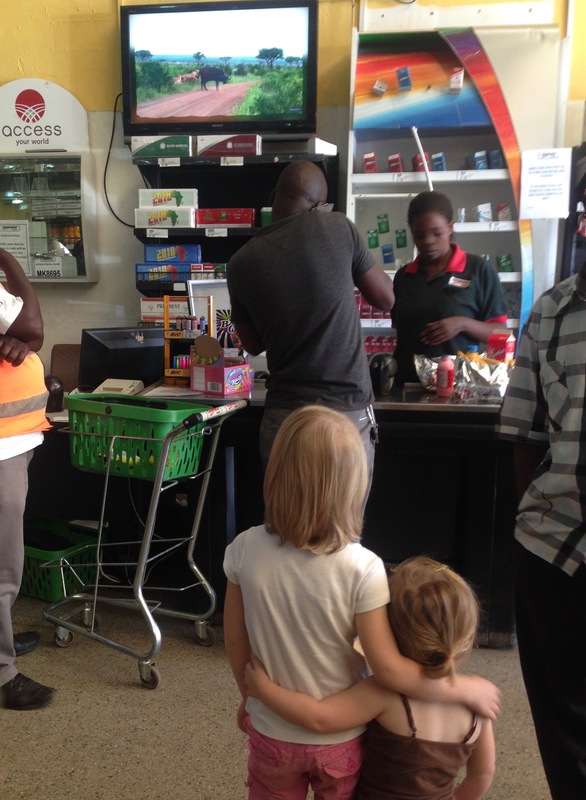 Just another lunch in Lilongwe! Grocery shopping day, and Naomi is ready! 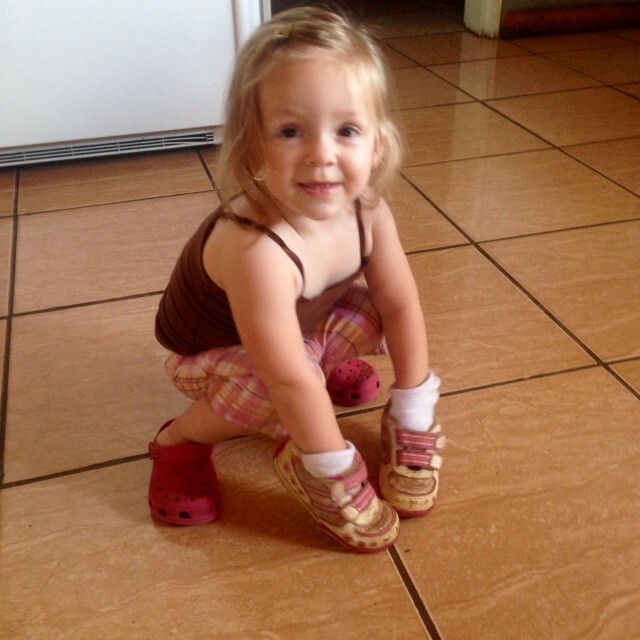 One can always use an extra pair of shoes with a day as busy as we had! 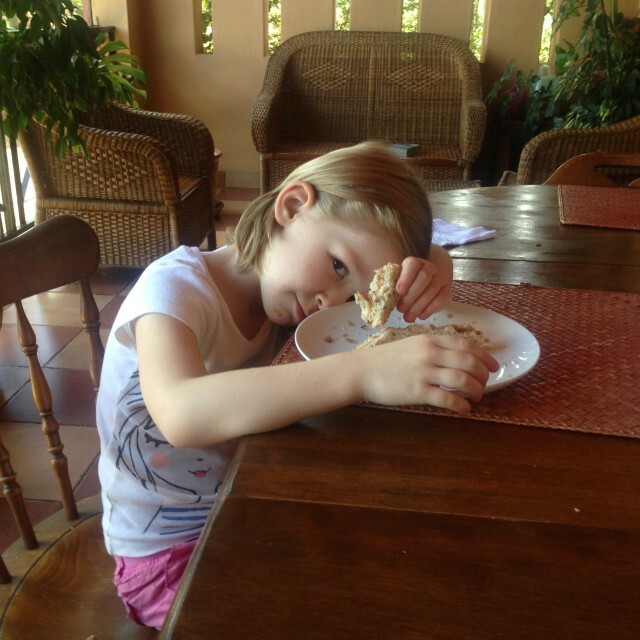 Breakfast was a family favorite – oatmeal. 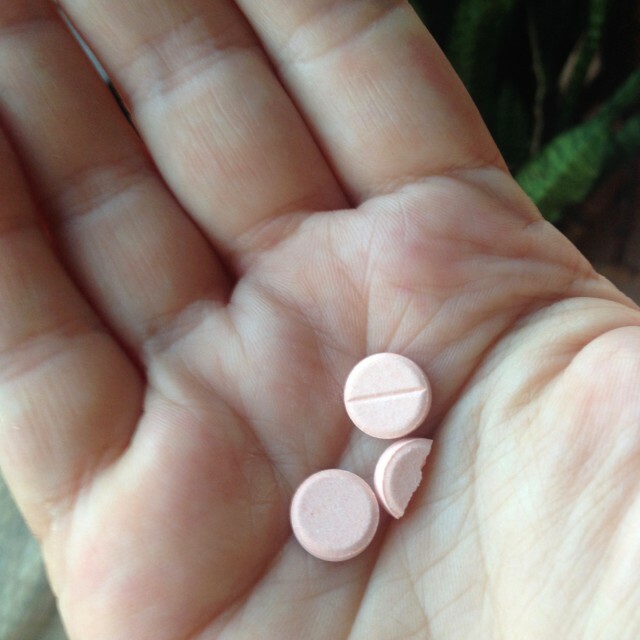 With a new not-favorite – chewable dewormer. Think bitter pepto bismol. Thankfully we only had to take these at breakfast and dinner today and we’re done. The girls didn’t balk at all, after a brief discussion of what worms are and why we don’t want them. School first before grocery shopping! 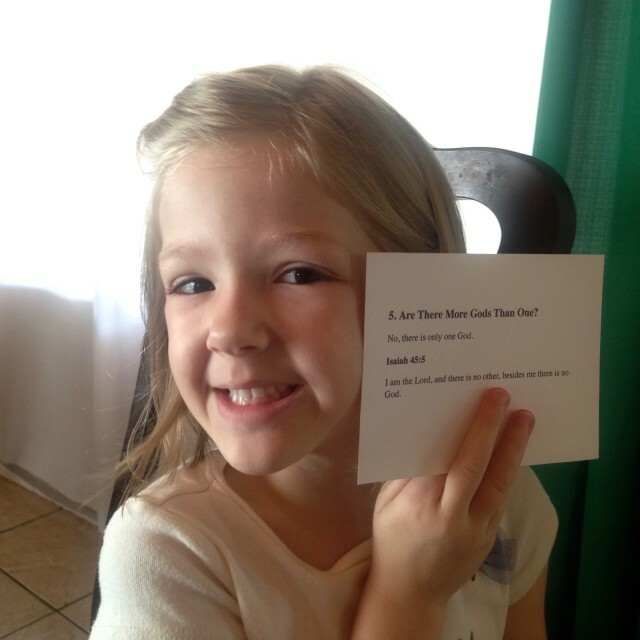 Abi loves school and is especially good at memorizing, so we recently added catechism with corresponding verses. It’s been great, and especially fun because we have songs to go with every catechism and verse! Dana Dirksen put together the songs into 6 albums, and is in the process of producing the same albums in several different languages – including Chichewa!!! The first album in Chichewa is already finished, so once we’ve mastered English, we’ll work on the same catechism and verses in Chichewa! Once school was finished, it was time to get ready to go out. This is how I usually dress when we go out. 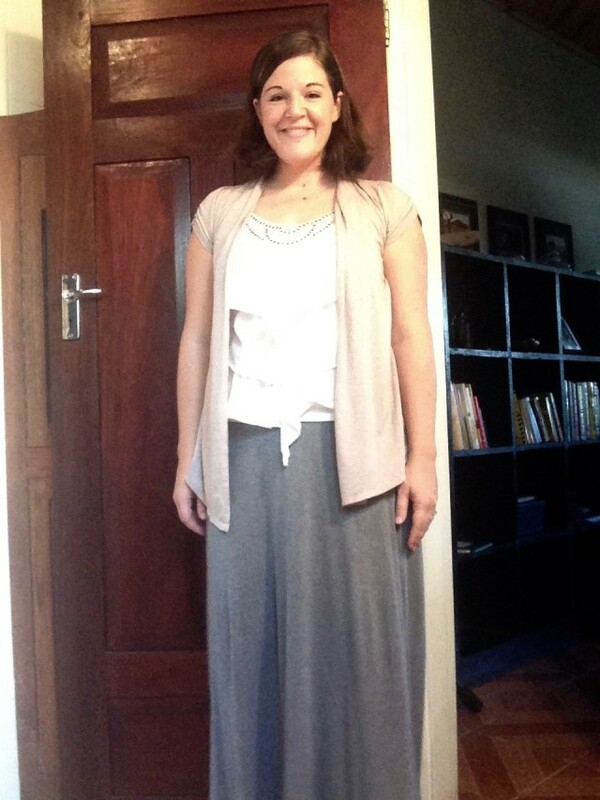 Malawians dress up to go to town, so I put on makeup, and try to dress nicely. It’s hard work to do the shopping here, and I have 2 little kids in tow, and it’s hot; so my go-to item of clothing is a maxi skirt. It’s modest, stretchy, and not suffocating. Add a top that dresses it up a little and we’re good to go. 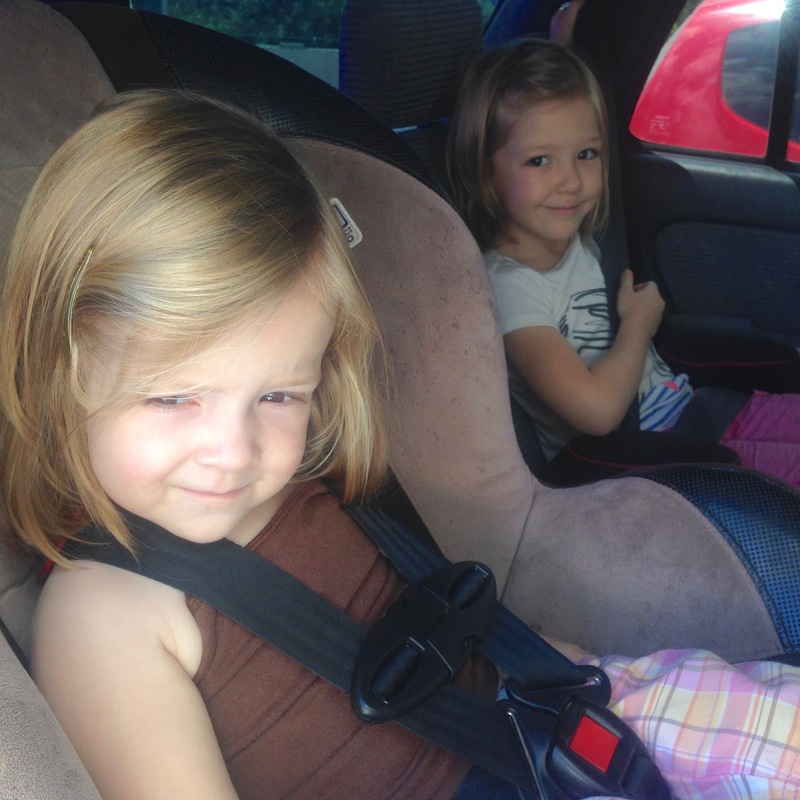 Most Malawians don’t use car seats, but we always have. I pray we never get in a bad car accident here, but if we do, I want every chance possible that these sweet girls will be safe! On to see the Swan Man. For those of you who have followed our blog for a while, no, I still don’t know his name. 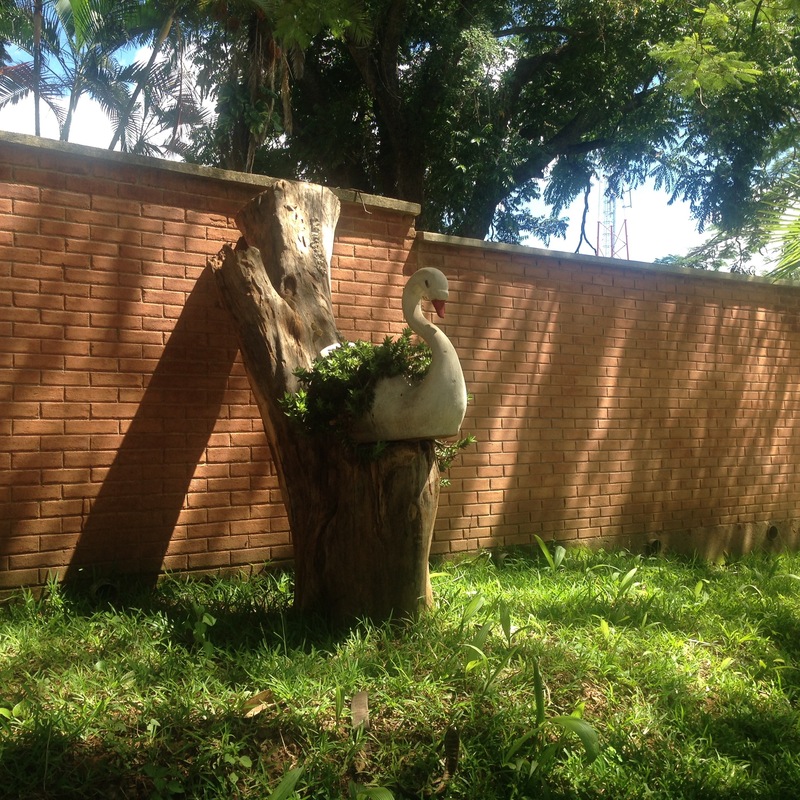 But he’s still a good tailor, and I took a picture just to show you why he’s called the swan man. We’ve been to see the tailor frequently of late, so much so that he keeps pretty and sparkly scraps to give to my girls now! =) Last week we dropped off a suit of Matt’s to be altered, then a few days later half of the cushions that go on our wicker furniture so they could be recovered. We couldn’t drop them all off, because we still had a couple people who would need to sit on those chairs, like the ladies who come for counseling. 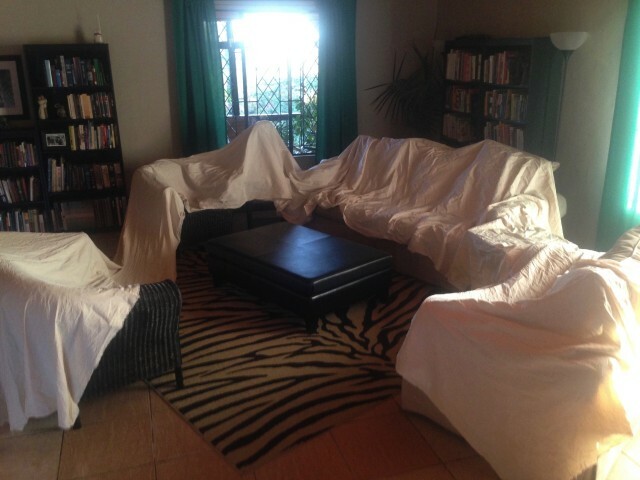 But we dropped all the rest of the cushions off today (and there’s the 13 meters of fabric sitting on top of the cushions), and should be able to pick up the first batch on Saturday. We’re cushionless for 3 days, but it’s ok.
And then we drove to the far north end of town to a shop called Carniwors that specializes in meat. 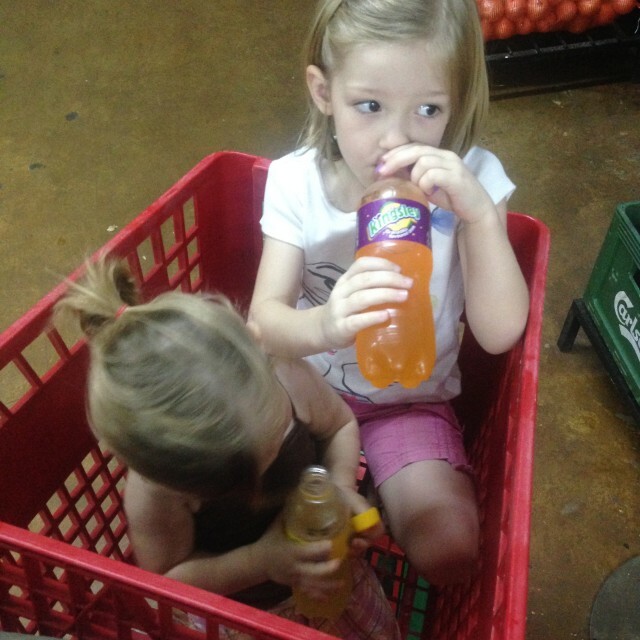 By this time we were getting a little tired and very hot, so the Abi and Naomi got granadilla and pineapple “spicy juice” (carbonated). And I let them ride in the cart while I planned out the menus for the team of 8 that is coming to stay with us in just over a week. Oh yes, my FBC friends who are coming next week. Yes I did. Think pork – you’ll love it. When else will you get to eat it? And for $1.25/pound, it’s a great deal! Finally, with a large ice chest full of meat, we made our way home. We had gotten all the miscellaneous errands accomplished, with only the actual grocery store yet to do. But that would have to wait. Peanut butter sandwiches and a nap were necessary first! The girls lay down and both slept for 1 1/2 – 2 hours. I headed into my room and turned on the window box fan and the mister outside the bedroom window to enjoy a little evaporative cooling. I have the greatest husband and he makes some pretty fantastic things! Ahhhh! 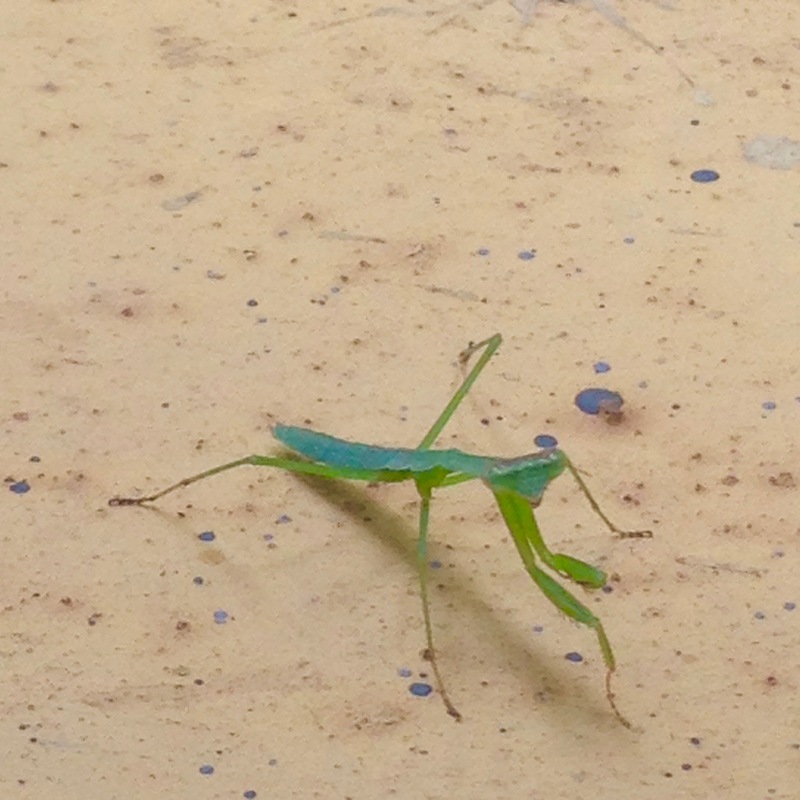 And I found a little friend on the window sill. Little, as in, only about 1 inch long. We’ve seen several of these little praying mantises in the yard lately, and thanks to my inquisitive 5 year old, we’ve looked them up and know that they are actually babies. Various kinds of adult praying mantises can be 1-4 inches long, but you know it’s a baby if it doesn’t have wings yet – like this one. 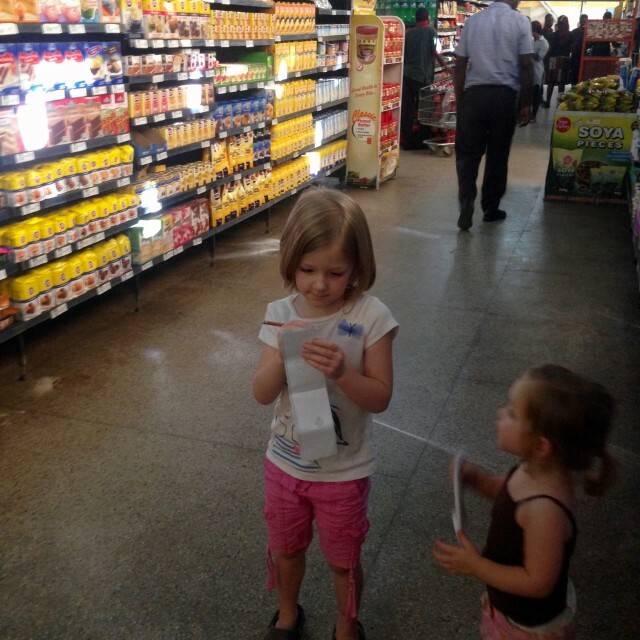 The reason she knows it’s not on the list is because I keep my shopping lists in order of how we walk up and down the aisles in this store and she tracks with the list to know where we’re at in our shopping. I know, it’s nerdy, but it saves so much time running back and forth, especially when shopping with little ones. Even nerdier: I have a series of 4 shopping lists that I cycle through each month. Today was the Week 1 list, when I buy all our meat, milk, cheese, and frozen vegetables for the month. Next week will include a month’s worth of dog food, the following week all the tea supplies for our staff for the month… It just works out better to divide that stuff up and plan to buy in bulk when I can. And because I have a large chest freezer at home, I can. Check out is always a little harried. I had 2 “trollies” of groceries today, so I had to put all the groceries on the checkout counter – but not any faster than the cashier could scan them because it’s not a very big counter! I also kind of keep an eye on whoever is packing my groceries into bags or boxes on the end, as it’s not uncommon for the tomatoes to end up on the bottom, and the dish soap to be bagged with the yogurt and they both leak. Paying for it all takes a bit of time too, as I have to count out the money, then the cashier has to count it all out too. Because it’s all cash. And the largest kwacha bill we have is currently worth only $1.38. So, just imagine paying for all your groceries (and those of a visiting team of 8) with $1 bills. It takes a little time and attention. Not to mention I have 2 little girls who need a little attention too. 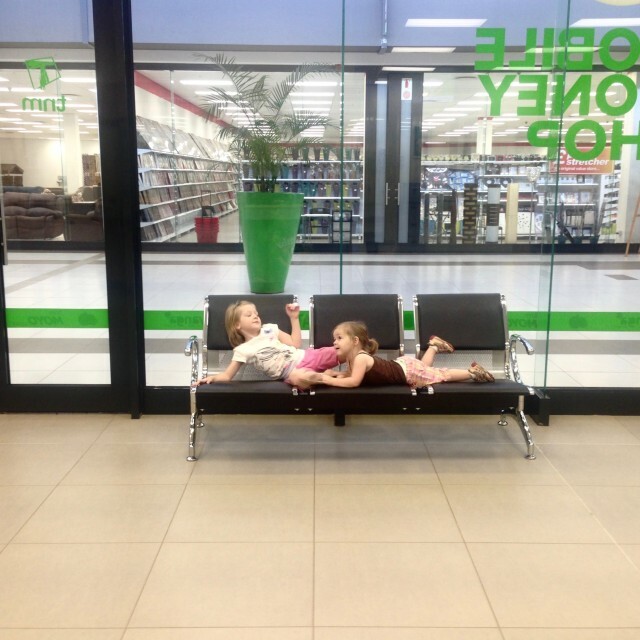 Thankfully, there’s a TV hanging at that end of the store that always plays the National Geographic channel. It’s always interesting, and evidently a bonding experience too! We got home just before 5pm. Whew. Mission accomplished. 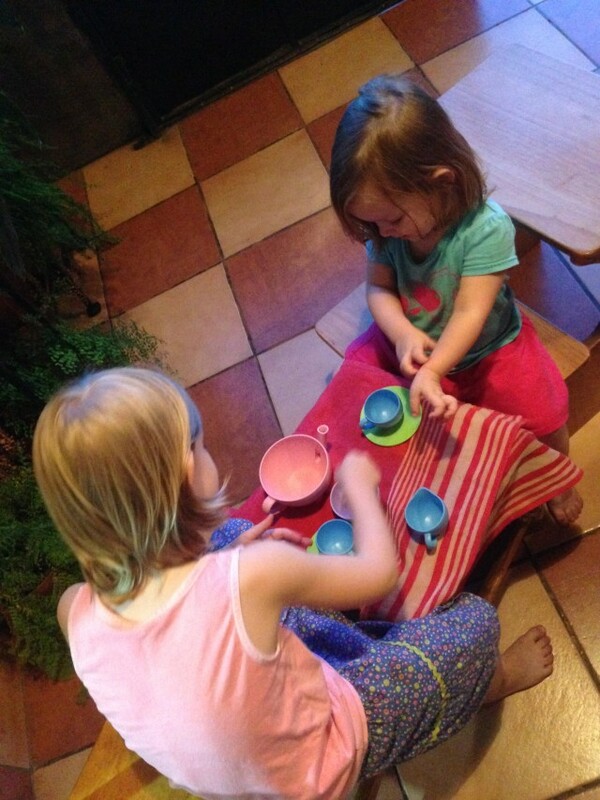 The girls colored while I put all the groceries away and made smoothies for dinner. Like that cup Naomi has? 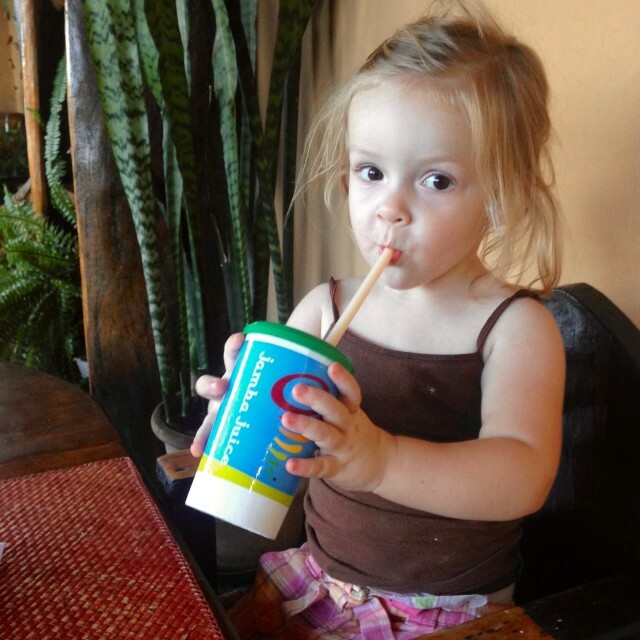 I think most people just throw those cups and lids away after they use them, but I held on to it after a trip to Jamba Juice when we were in California in 2014. Still going strong! The girls did great today. They were both super helpful, very cooperative, and didn’t complain! I’m not used to taking both of them with me, as Matt has set aside a couple hours on Thursday afternoons to spend some undivided time with one or the other of the girls each week. We trade off every second week, and it’s know as Abi and Dad Day, or Naomi and Dad Day. 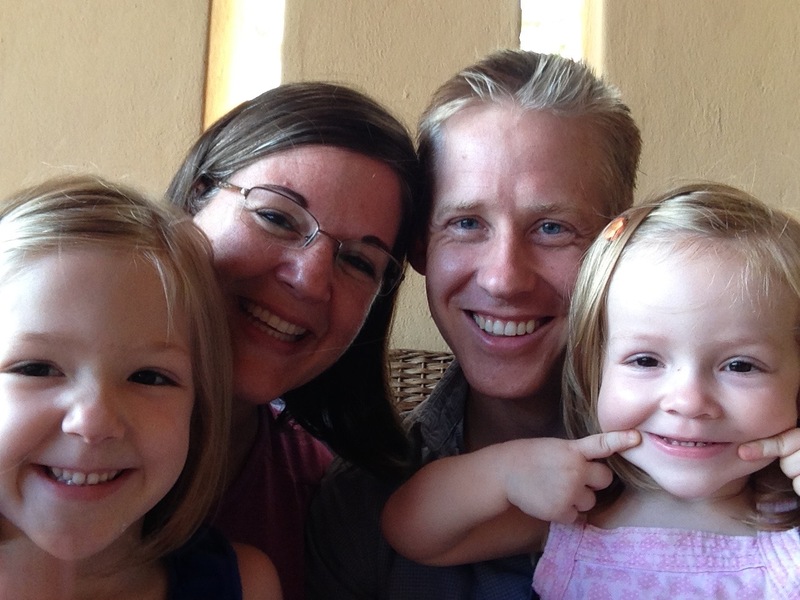 But this week, Abi declared that it was Abi and Naomi and Mom Day. I love it. It was still special as compared to all the other days we have been together this week, and still worthy of a special title! Tuesday morning brings Priscilla back to our house at 7:30am, so the girls spent their morning coloring, building train tracks, and reading books with her. I was starting to feel the pressure of a backlog of items that needed to be sewn – and the very strong desire to run away from the taxes I probably should have been finishing up today – so I tackled a couple more urgent mending jobs and then immersed myself in a fun sewing spree. I spent about half the morning with this friend. I have a very old singer sewing machine also, and today they sat side by side as I moved back and forth between the two, but this overlocker machine is fantastic. Matt was pretty skeptical when I registered for it on our wedding registry, and rather shocked when we got it! 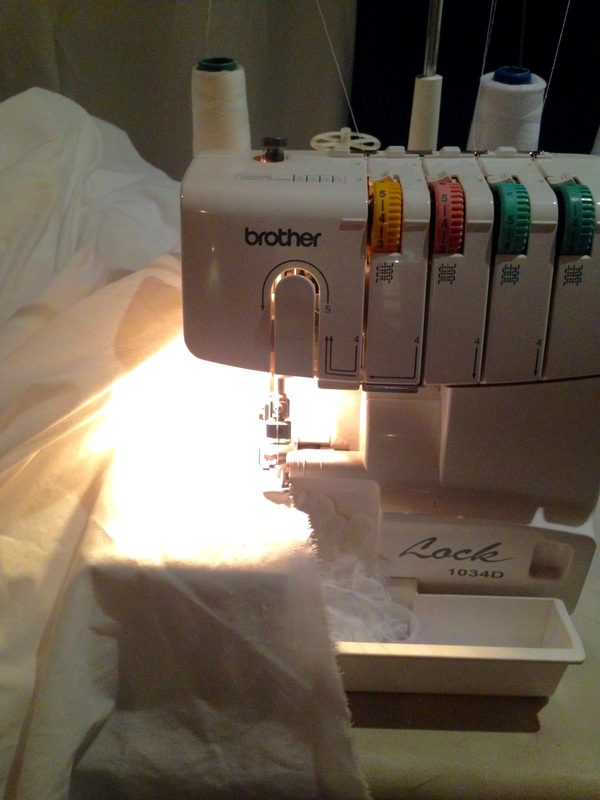 I’d never had a “fancy” sewing machine before, but after almost 8 years of good use, I can’t imagine sewing without it! Today’s fun sewing project also had practical value: bed sheets! Abi had come with me to the old part of town a couple weeks ago to buy fabric to recover the cushions on our wicker furniture, and I think it was she who discovered the sheeting material. She fell in love with the purple stripe, and when I showed her the matching solid purple (her favorite color), she did a little dance and laughed out loud! 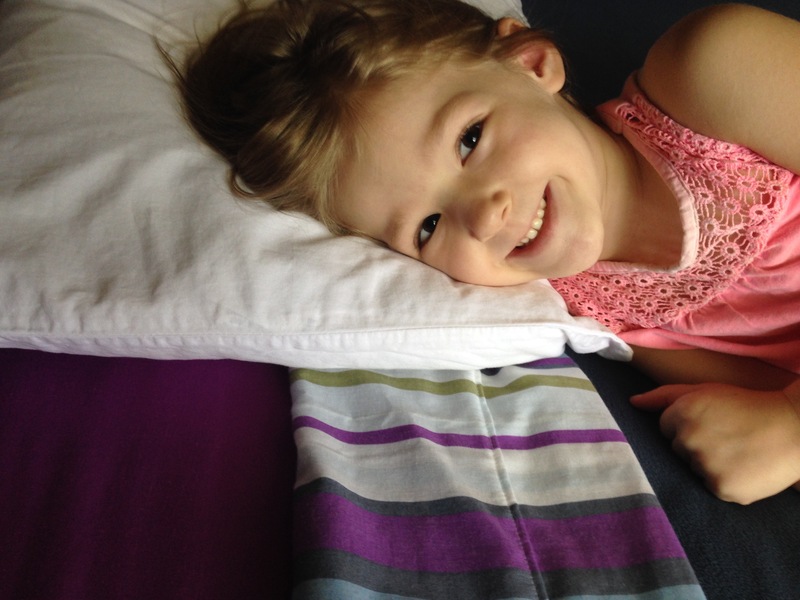 So she now has a purple fitted sheet and a striped top sheet. And she LOVES them! The other set of sheets is queen-size to replace an old set that was becoming brittle and too thin. But the fabric that I found for that set is amazing. It’s the (blazing brilliant!) white in the first picture, but it’s some of the best sheeting material I’ve ever seen. It’s solid, medium weight, with a smooth almost velvety feel. Think high-end hotel sheets. And the fabric cost me half of what I would pay to buy a mediocre set of sheets in America. My time counts for something, of course, but I did make 2 sets in about 2 hours, so I think I’m ok with the time! I also ran over to see my friend Susan again. The medicine to treat the bacterial meningitis continues to work, and she was up on her feet to meet me at the door today! She had finished all the books I took her on Saturday, so I brought her 3 more books, and a little loaf of banana bread that we had made yesterday. The afternoon was back to more routine things – Abi and I did school while Naomi slept and Priscilla cleaned out all my kitchen cupboards. About the time Naomi woke up, I started working on dinner, because I knew I needed a little extra time today. I made a triple batch of rice and Spicy Beef with Peppers stir fry, to keep one batch for us and send the rest home with Carol for her family this evening. Carol works full time and has spent the last 14 months caring for one family member or another, herself included, as their family has experienced injury and illness almost continually during that time. The Lord has chosen a serious path for this family for this time, and I have known the blessing of not only being able to help in small ways, but also to be able to see the Lord strengthen their faith. We love this family so much and it hurts to see them suffer, but we too must trust the Lord, entrusting our friends to Him. 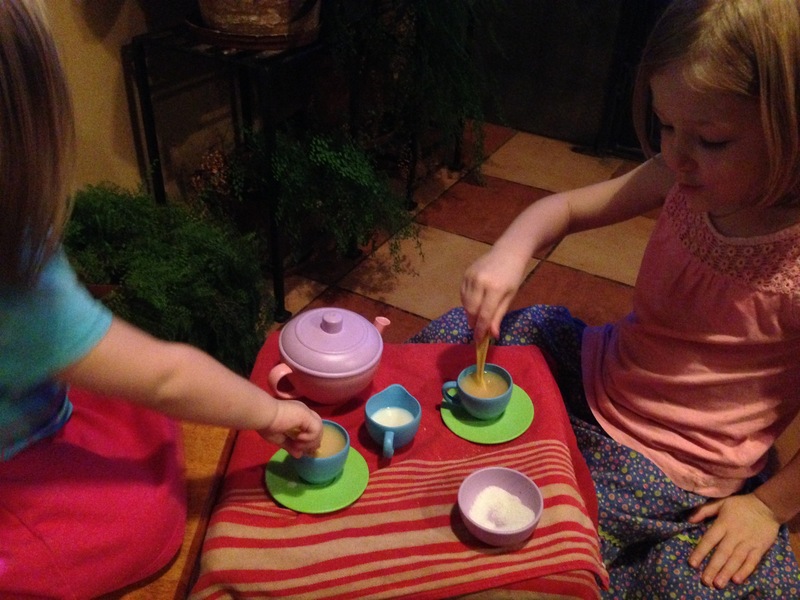 So they had their little tea party. 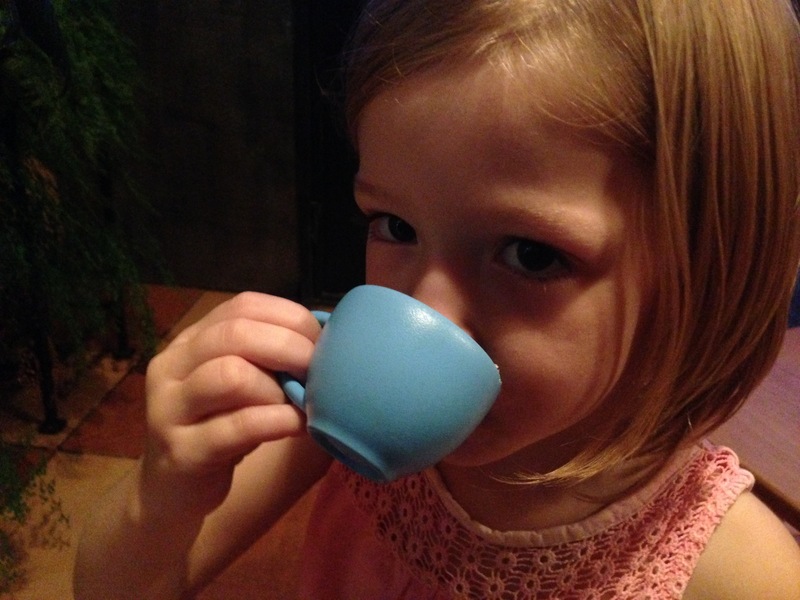 Two cups of rooibos tea apiece. They were very careful and didn’t spill a drop. Today we dropped our favorite guy off at the airport, not to see him for 9 whole days. 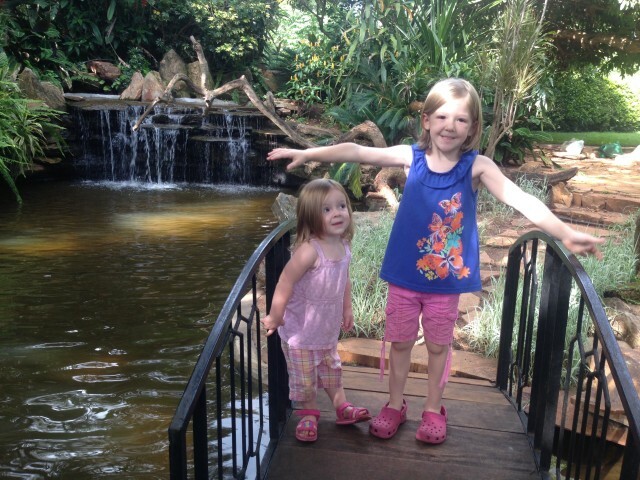 Matt’s off to meetings and conferences in the States, so it’s just the girls here in the wilds of Africa! So in an effort to keep him up to date with what we girls are doing, and to add a little life to the blog, I’ll post on here every day while he’s gone. Today’s big event was, of course, Matt’s departure. We spent the first half of the morning helping him pack, running last minute wheelbarrow marathon races with him, and enjoying him as much as possible. Then mid-morning we took him to the airport. The girls did fine, but mom might have shed a couple tears. 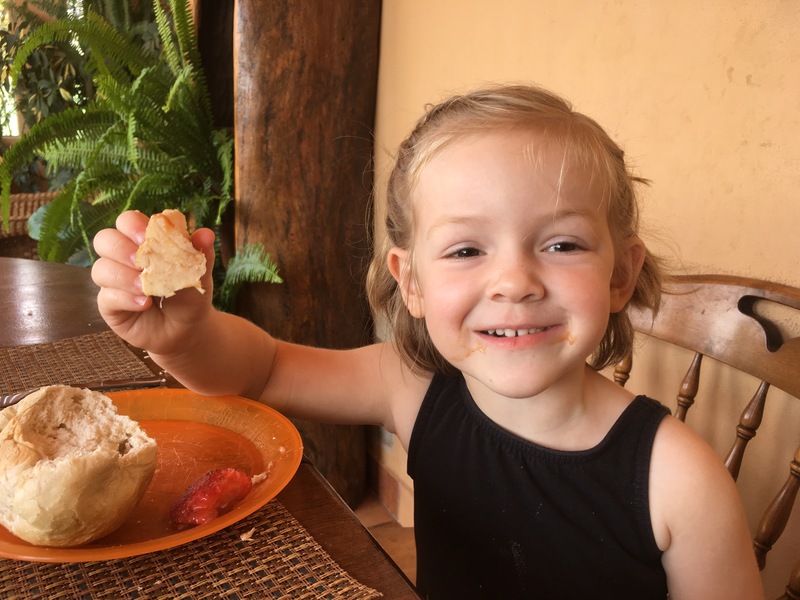 I was just getting teary on the drive home when Abigail started asking why you can’t take bombs and knives on airplanes… and so I was distracted by explaining why bombs and drugs and such are bad to my 5 year old. The early afternoon was fine, with rest times for everyone and catching up on Abi’s school that we hadn’t done in the morning. Then about 3 we decided to go on a field trip to the plant nursery across town to see if we could find the three types of plants that Abi has been studying in science – plants that reproduce by seeds, by runners, and by division of bulbs. We found them all at Four Seasons Nursery and *BONUS* water plants too! 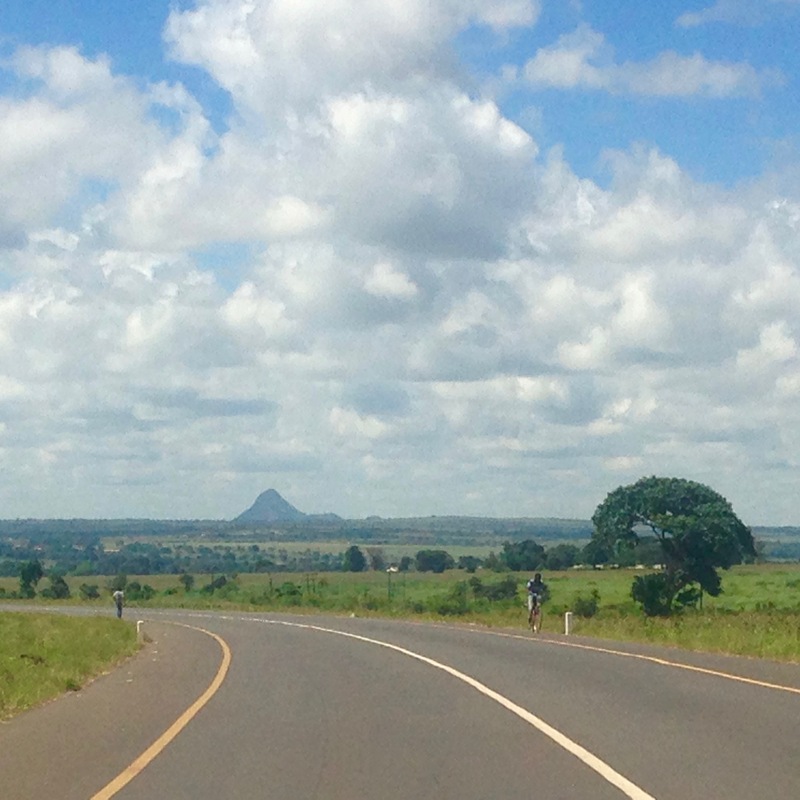 Then on the way home from the nursery, we did something I never thought I’d do in Malawi. We went to a drive-thru! Seriously! 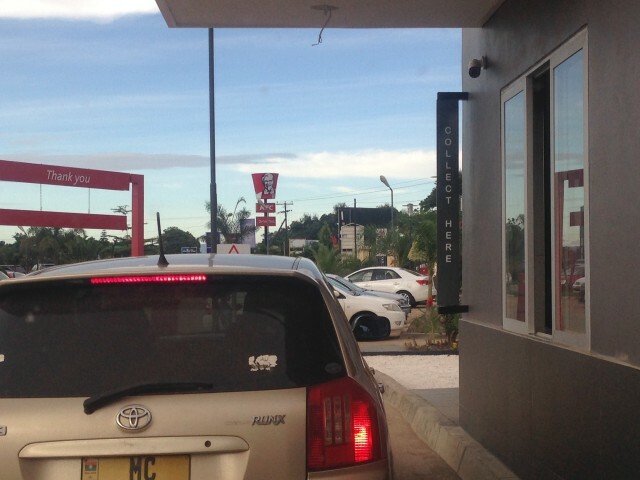 KFC opened up just a couple weeks ago, and they have the very first drive-thru in town (in the country?)! It was at the same time a very African and a very American experience. The American experience was 1) order at the speaker box, 2) pay at the first window, and 3) pick up at the second window. It felt normal and very odd at the same time. The African part was that right next to the drive-thru lane they were digging up what appeared to be a broken septic line. That also felt normal and very odd at the same time. It’s been about 10 years since I had KFC, and I think I could probably go another 10 years without it. I think Naomi is in agreement with me on this one. Abigail, however, for the first time in her life, declared that she loved mashed potatoes. The part of me that makes 98% of our meals from scratch sighed very deeply at forfeiting this major victory to KFC. The rest of the evening was normal, but bed time was a little difficult for Naomi. She cried and cried about “Dada, airport!” We walked up and down the hall, finding him in every picture hung on the walls. Then we prayed for him and I sang her a couple songs before she said she would go to sleep. Sweet girl! Now I sit quietly in the dark, thankful for the inverter that Matt installed to give us enough power for computers and internet when we have a power outage. It’s been a good day, but a little emotional. Matt and I haven’t been apart for more than 3-4 days since… December 2007? 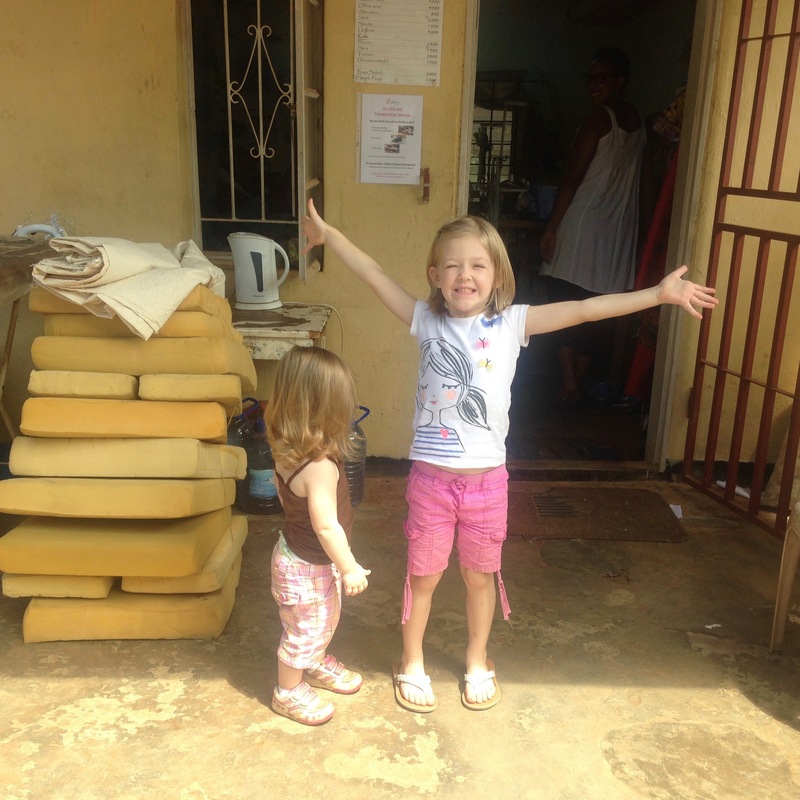 I know that we’ll be fine and that the days will fly by, but I think I can speak on behalf of all three Floreen girls in the warm heart of Africa: Absence make the heart grow fonder. I had given up on getting any more good strawberries here in Malawi. It’s the end of the season, so the price is going up and the quality is going down. Sadly we missed most of strawberry season while we were in the States, so I didn’t get a large batch of strawberries frozen for smoothies throughout the year. 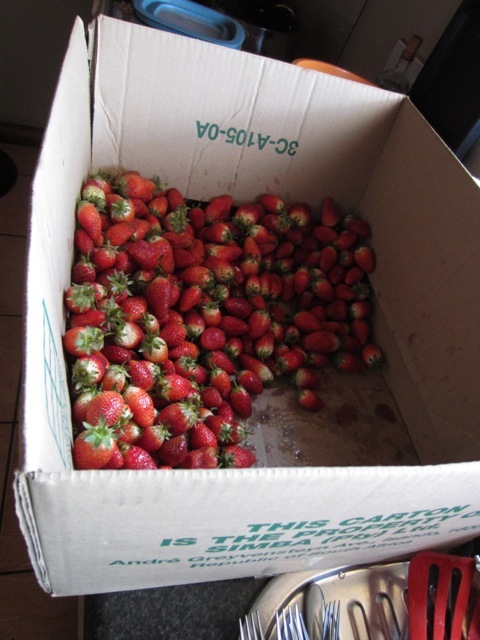 I mentioned that to Matt the other day… and then today he came home with 13 kgs of great strawberries for me. That’s 29 pounds of strawberries! And he got a great deal on them! 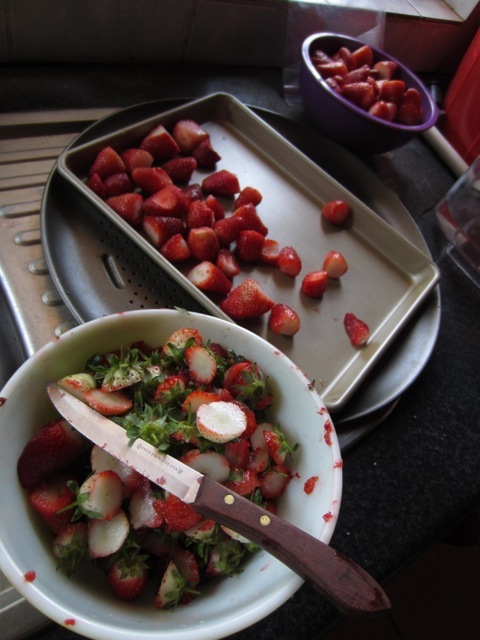 I cleaned strawberries for about 2 hours. We kept a bowl of them to eat, and froze then bagged the rest to keep in the deep freeze for the next several months. Almost done! The last quarter of the box remains. 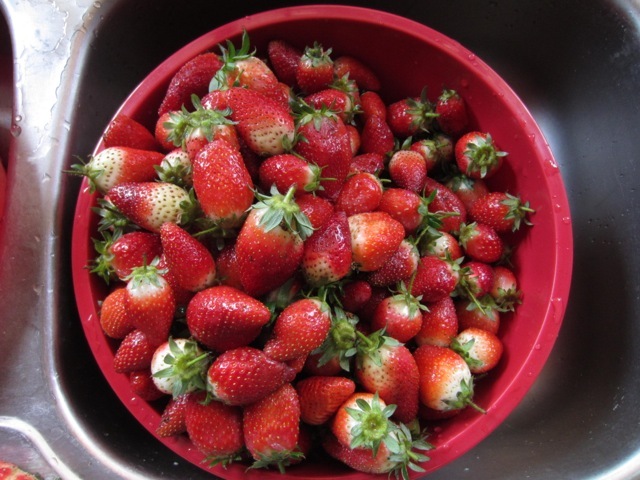 I think we’ll have strawberry pie tomorrow, and then smoothies throughout the hot season! 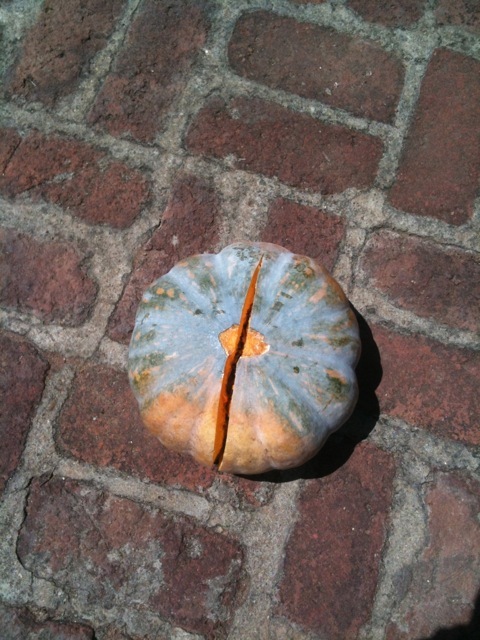 I have had the WORST time cutting pumpkins here in Malawi. They are SO tough. I would poke a knife in the top, hammer it in with a meat mallet, and then smack the whole pumpkin on the ground until I could get the knife through. Whew. Blood, sweat, and tears. Then I asked a Malawian friend how she cuts open a pumpkin. She said – throw it on the ground. Really? 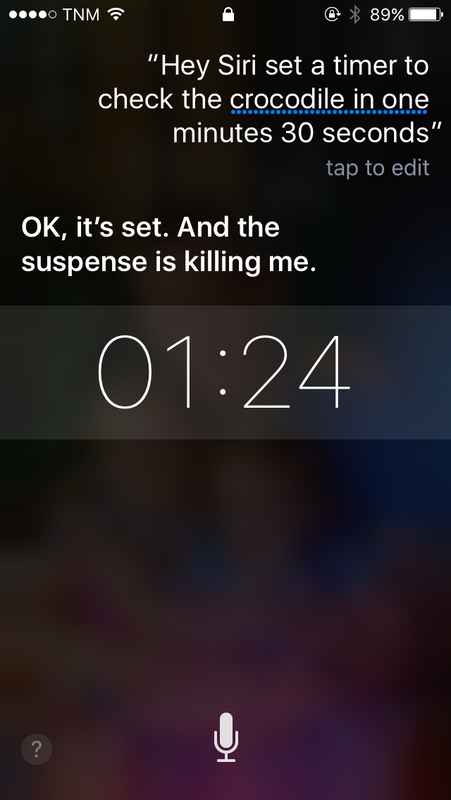 ?… OK. So I tried it. We’re usually up for a good adventure, and tonight it was crocodile… for dinner. We’ve had crocodile at a restaurant before and it was so-so. 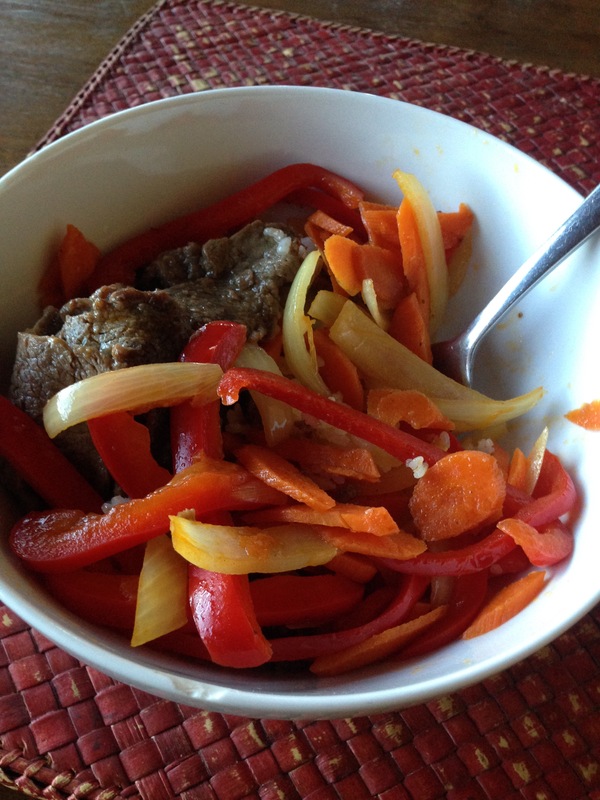 We were pleasantly surprised tonight, and actually enjoyed fixing and eating it at home! 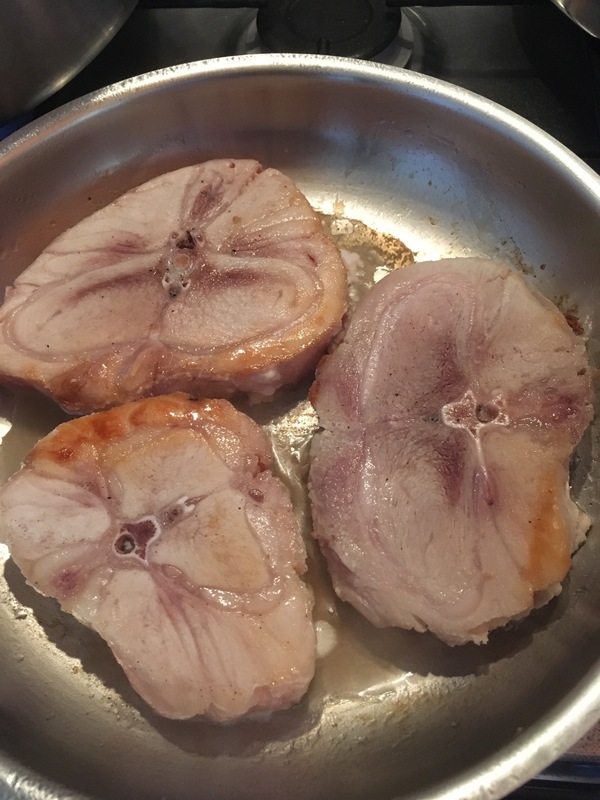 It kind of has the taste and texture of a pork chop. 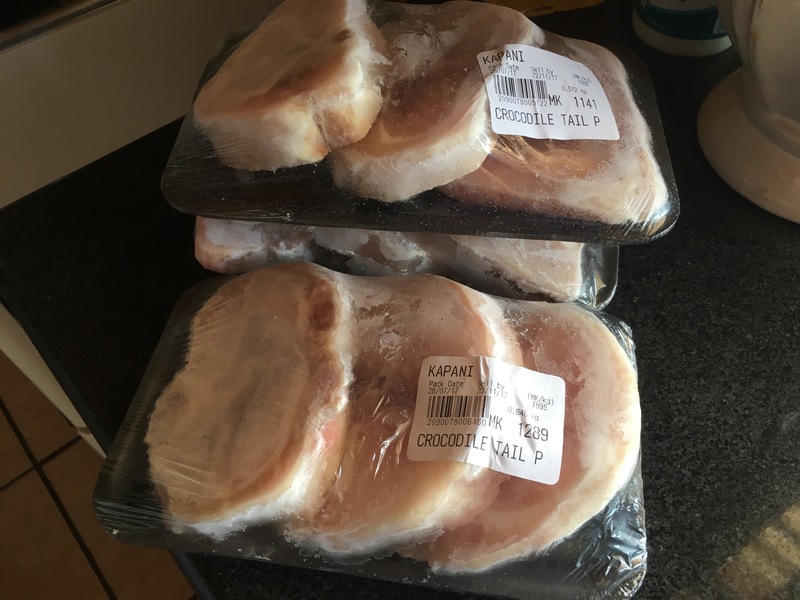 Two tips in case you ever find yourself cooking up some crocodile: cook it from frozen and use a fruity marinade, like a peach and apricot chutney. This is one of the very few crocodile experiences we’d be happy to repeat!